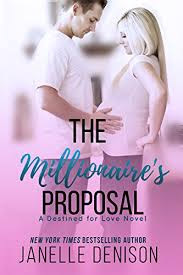 This a sweet and short romance novella by Janelle Denison, however this book was previously released as the Baby's Surprise and has now been improved and re-released. The book is a second chance romance which pulls you in with the great writing which brings the characters to life. I loved the alpha male character Ford, who even with his tough upbringing makes a successful man of himself. Janelle makes you feel the pain that Ford goes through especially his struggle with his past and his fight for acceptance in a town that always considered him an outsider. Grace's character also brings out tears especially when she is craving her father's approval. I enjoyed the chemistry between Grace and Ford, however some parts of the story felt very old fashioned. The greatest downfall of the book is that the story is not unique and is very predictable. Grace Holbrook, a florist, runs into one of the most gorgeous men she has ever seen, but little does she know that the gorgeous hunk is her first love and the boy who broke her heart eleven years ago. After realizing the hot man is the man she never stopped loving, they spend a passionate night together. Grace who thinks she is infertile, falls pregnant with the towns bad boy baby. Ford McCabe, is known as the towns bad boy and has always been treated like an outsider in his own town. He returns in order to improve his reputation and get back Grace, the love of his life. However Ford's return comes with many secrets from both past and present. When Ford realizes Grace is pregnant, he insists that they get married right away. Grace is unhappy with decision, but finally agrees for the sake of her child. Will their relationship be able to face the secrets Ford hides and the wrath of an angry father and disapproving town?